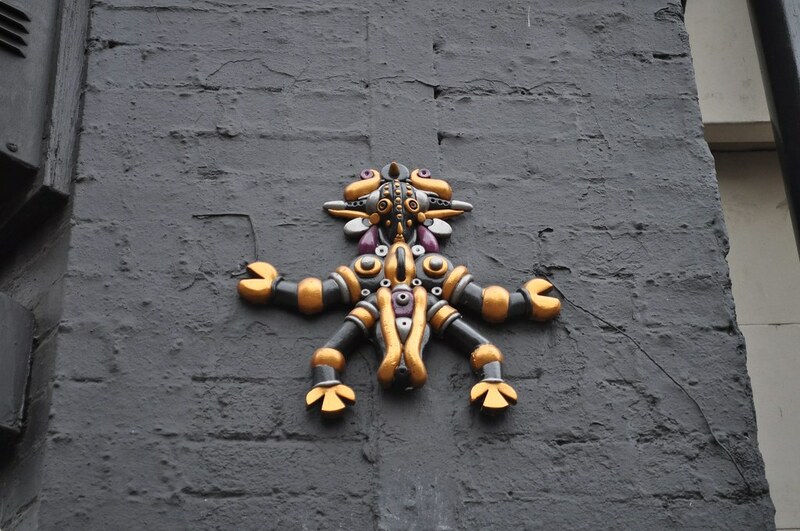 CityzenKane’s impressive sculpture of Lord Jagannath glistens and glitters against the wall of Brick Lane. 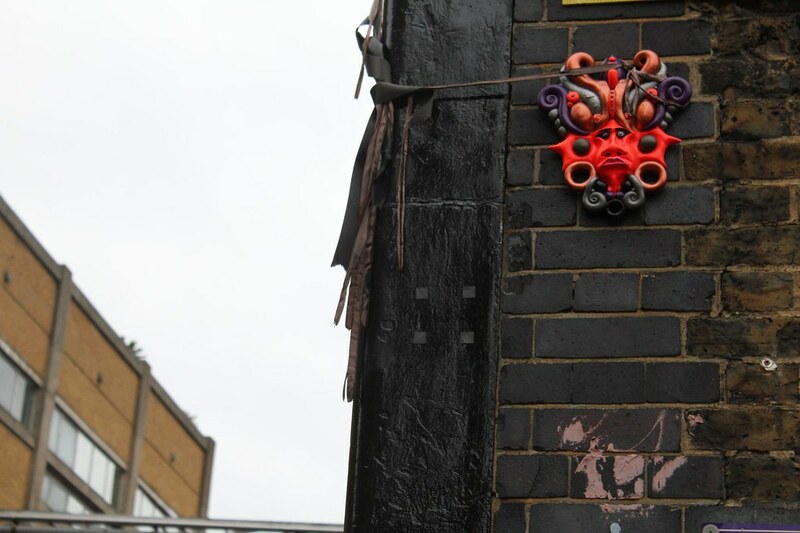 Around the corner, a gun pops out from another wall and if you wander through London’s East End, you’ll catch a glimpse of CZK’s kissing fish, spirit masks, bugs and other colourful creatures standing out in 3-D amongst the rest of the spray paint and posters. Read on for Street Art London’s conversation with CZK on how house music and a bloke with a pipe inspired him to be the street artist he is today and what look out for from him next on the South Bank. Plus, don’t miss out on the background story of that well-loved Lord Jagannath piece. Give us a short history of your artistic background and how you first got into street art. Since a very young age I have been drawing and making sculptures. In the late 80s, the house music revolution changed my life. Being very much involved with the scene, I considered it to be a very enlightening and spiritual experience for me. I would have amazing visions of organic shapes and colours in symmetry, so I decided to express these visions through my art. 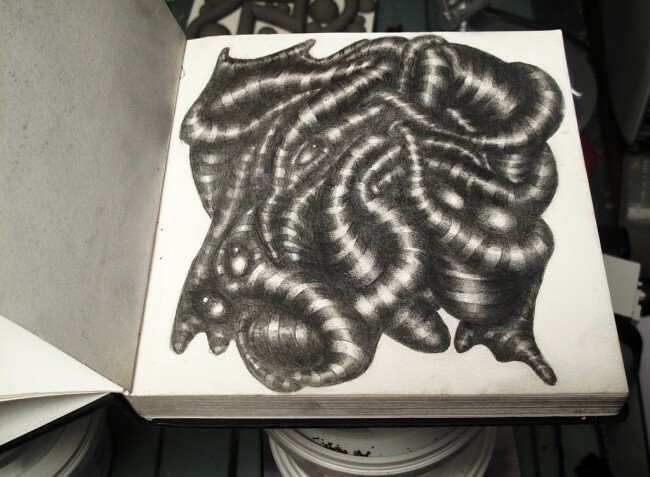 I became prolific with my drawings and making sculptures out of expanding foam and Fimo. I was living in Brighton at the time and there was a stencil artist whose name I don’t remember, who had stencils of a bloke with a pipe. His work was everywhere and this inspired me to start putting stencils up too. We’ve spotted a good number of CZK works around East London lately. Tell us about the creative process behind these recent pieces. I never start out with a pre-conceived idea of what I am going to make. Most of the time symmetry is the guiding force; other than that they simply evolve in the moment. In terms of my 3D work, I make a master, usually out of polymer clay which I find to be a very accurate and precise medium. I then make a mould with silicone rubber. A cast which can then be replicated endlessly is then made in Crystal Plaster of Paris. I also make one off pieces which are more elaborate and refined. If anyone is interested you can see the process on my YouTube channel. 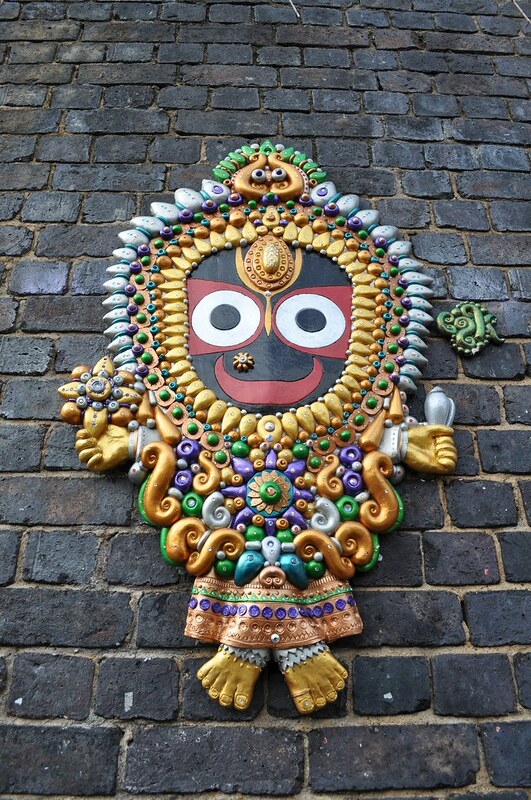 We’re big fans of your ‘Lord Jagannath’ street sculpture over on Brick Lane. Can you tell us a bit about this work in particular? Part of my journey is the discovery and exploration of the ancient Sanskrit writings of India. I follow the Gaudia Vaisnava Sampradia, or Hare Krishna teachings, and although up until recently my work has had an ancient, alien, Eastern leaning I am now aligning this very deep philosophy with my work. Jagannath is a very ancient Vaisnava Diety. He is seen around the world at the Ratha Yatra cart festival, the oldest consecutive running festival known to man. Why do you think street art is important and what messages are you are hoping to communicate through your street art? Initially my intention was to have no message whatsoever. I wanted people to stumble upon them and simply wonder what they are and why they are there. It does concern me that it is becoming corporatised. I don’t have a problem with artists making money from it, but I’m concerned that critics and the market dictate the scene, something that I hate about the mainstream art world. For instance JR at Vandalog said this about me. Critics dictating what street art should be…… Ominous. You’re also a political activist. Do you have any particular political issues are on your mind now and how do they infiltrate the work you put up on the streets? I am a political activist and street art is a vehicle that has been used for centuries to convey uncensored political messages. It’s still going on. That’s why Hackney council wants to keep the walls grey. Grey walls in a grey society. I have always been interested in counter culture. I tend to steer away from anything mainstream, hence my attraction to street art. One of the reasons your work stands out on the walls is because it is 3-dimensional. Do you ever feel limited or restricted by this choice or do you find it always enhances your ability to express yourself creatively? I’m limited in the sense that the bigger the piece becomes the heavier it is. Jagannath weighed about 30lbs and it nearly broke my back getting it on the wall! My next piece will incorporate 2D paint. Which piece of street art are you most proud of at the moment and what does it mean to you? I think it has to be my Lord Jagannath piece. It’s my most elaborate piece to date and I like the fact that it’s still there. I think people think it’s meant to be there so they leave him alone. Quite a bit of your work is done in polymer clay, but you’ve used a lot of other materials as well. What’s the most unique material you’ve worked with and is there something new you’d like to try? I am also doing a lot of drawing which helps keep the process going. 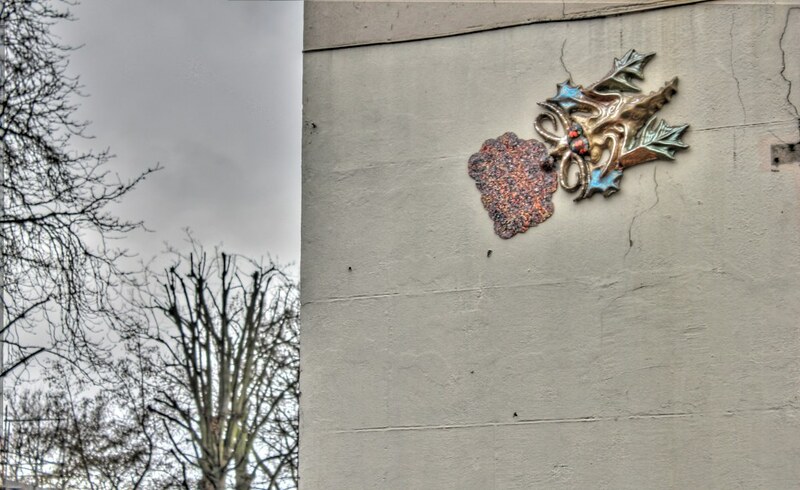 Who is your favourite street artist in London right now? I love JR, Faith 47, Blu and Banksy, of course, and Best Ever. There is a lot of exciting and diverse work out there. Tell us about the new street pieces that you are putting up on the South Bank. What else can we look forward to from you in 2011? My new pieces at the South Bank, will hopefully be an amalgamation of 2D and a collection of various new 3D pieces which have taken on an alien, insect feel. Being in a ‘legal’ spot should allow me to devote more time to the work. As for 2011 I hope to create larger and more elaborate pieces and venture into Europe.